I hope Jeon In Suk did not abondon her without taking care that she is safe, with a lovely family. Park Sun Ja and Kang Cheol Man had difficulties with money, they had a daughter, but they still adopted her. Two thumbs up for them. It would have been better if she would have known her story when she was young, but everything will be fine eventually. Kim Hae Sook and Kim So Yeon play this time the role of mother and daughter. They almost played together in Father is Strange. I can`t wait to see their scenes. Actress Kim Hae-sook confirmed her appearance on KBS2 weekend drama "My daughter, the most beautiful girl in the world". "My daughter, the most beautiful girl in the world," which is broadcasted first in March, is a drama that conveys comfort to all the mothers and daughters who are struggling to survive this age through the story of four women who became affectionate in a warlike day. Kim Hae-sook was the mother of three daughters. Park Sun-ja is a typical Korean mother with all the grievances she has experienced once in a patriarchal era. She will give infinite empathy to all family audiences in Korea from the younger generation to the older generation. The production team of 'My daughter, the most beautiful in the world' is the role that only Kim Hae Suk actress can express. "I will show a picture of a 'national mom' who communicates sympathy and comfort to all viewers." Finally they made the official confirmation . I will look forward to see her performance. Park Keun-soo takes on Park Yeong-dal, the younger brother of Park Sun Ja (Kim Hae Sook) and transforms into a comic and pleasant character. Sometimes they act as mediators mediating conflicts between his sister and the three nieces. He has appeared regularly with his unique acting, starring in various drama such as Father, I'll Take Care of You, My Sassy Girl , Sungkyunkwan Scandal. Pictures of reading the script, which was filled with the warmth of 'My daughter, the most beautiful in the world', was revealed. Kim Hae Sook, Yoo sun, Kim So-yeon, Hong Jong-hyun, Choi Myung-gil, Ju Hyun, Park Jung-soo and Kita Tae-yong have all appeared on the scene. Prior to the start, Kim Jong-kwang PD said, "I'm glad to be able to meet some of the best actors in one place." "I am relieved to see good people. I will try to make a good script so that it does not hurt you. " When the script reading began, the actors showed concentration that they were immersed in their role at once. Kim Hae-sook has played the role of the mother of three sisters, Park Seon-ja. Yoo Sun, Kim So Yeon and Kim Ha Kyung also raised expectations with teamwork like reality sisters. In particular, Kim So-yeon expressed er passion for the character as a alpha girl. @larus: From the first script reading, I think I was right to think this is triangle love. So Yeon sits next to Jong Hyun then Tae Young. I think they usually sit next to people who are practicing the lines with ? I don`t think you forgot the password. It was a problem on Soompi yesterday. I could not sign in either and I did NOT forget my password. I changed it and then I saw on Announcements that indeed was a problem. Wellcome back! No, it is not a "rule" to sit next to each other but usually they do. Yes, I think it will be a love triangle because they want to make things more complicated. This writer had a love triangle in another drama and the heroine ended up with the "second" lead. This time "the other man" could remain just a friend or another love interest, who knows! I also think that the youngest sister, Mi Hye (played by Kim Ha Kyung), will have two love interests played by Nam Tae-Boo and Han Ki Woong. She doesn`t sit near but in the pictures with the cast, she is next to them. Is this a sign? But I already suspected that because it`s plausible, the strory could go there. We have more than a month but I am waiting to see more informations, posters, teasers. I can`t believe that, until September, I will be busy watching this drama. Bring it on! But ...fingers crossed for a good drama. I am glad that we`ll have the first confirmation that they have started filming. Soyeon took a picture with other kids after the shooting for her new drama. I think Soyeon had a scene with the Yoo Ye rim, the child actor who plays her niece in the drama. There were other kids on the set. Maybe it was a kindergarden event in the drama. Actor Kim So-yeon appears in 'My daughter, the most beautiful in the world'. KBS2 new weekly drama 'My beautiful daughter in the world', which is scheduled to be broadcasted in March, is a drama that gives comfort to all the mothers and daughters in this age through the story of four women. Kim So yeon plays the role of Kang Mi Ri, is a high-powered, high-spec, high-income capable Alpha Girl who is not only proud of her love for work and affection but also the owner of affection for her mother. Through her company J-Wide Company, Kim So yeon said "Kang Mi-ri is the second daughter in the company who has a lot of coolness, but at home she is more affectionate and more charming " "I am very glad to have this work, and I am looking forward to seeing great people and having fun. I will be meeting you this spring, and until then I will be very excited and will be shooting hard. Thank you. " On the other hand, KBS 2TV weekend drama 'My beautiful daughter in the world' which Kim So Yeon confirmed her appearance is scheduled to air in March. "The Most Beautiful My Daughter in the World" released Kim Hae-sook` stills. Kim Seok-suk's first steal in the 'My Beautiful Daughter' in the world, reveals the return of a common mother. 'My daughter, the most beautiful girl in the world' is a drama that conveys comfort to all the mothers and daughters who are living hard in this age through the stories of four women . Kim Hae-sook, an acclaimed luxury actress, plays the role of her mother, Park Sun-ja, who has three daughters in the drama. In the photos, an extraordinary force of Park Sang-ja (Kim Hae-sook) who is wearing a yellow scooter helmet is caught, and it is showing an unusual appearance. The irony of her daughter 's clothes, the yellow hood and the hofi scarf, make her laugh, and her wiggly perms seem to be unresolved even if anything happens, and the strength of her mother who raised her three daughters can be seen. I am so glad to see the first stills of this drama. From Raw translation from computer, it is not very clear to me. She is wearing a perm and riding a motor scooter in a yellow outfit. She seems to be in trouble with the police. It was a minor driving accident? Kim Yeo Jin appears in 'My daughter, the most beautiful in the world'. She is working as a new employee "Cho Min-hye" in the marketing department of a large company along with Han Tae-ju (Hong Jong Hyun) in the drama. Min-hye, who joined the company at the same time as Tae-ju, appeals to her charm and will present a younger generation of office life. In the 9th The Musical Awards, Kim won the new actor award and earned a reputation as a performer. The actress who has proved her presence in the musical 'Jack Ripper', 'Iron mask', 'The Three Musketeers', appeared in MBC drama Father, I'll Take Care of You in the role of 'Hong writer' . I think she will have romantic feelings for Han Tae Joo. New stills for the first daughter Kang Mi Sun (Yoo Sun). Kang Mi-sun, a banker who seems to be in the middle of her career, I am guessing that something unusual has happened to her, who is seriously receiving phone calls from her home in a busy work environment with constantly coming and going customers and pouring work. I love that the stills are coming every day. We found out something new. Mi sun is working at a bank. Soyeon and the child actor who is playing her niece... and a puppy. Actress Kim So-yeon transforms into a perfect Alpha Girl and shows her exciting Woman Power. She plays the role of Kang Mi ri, is an alpha girl and a golden girl who have surpassed the handicaps of ordinary women. It is foreseeing the charisma that will bloom the audience's frustration. Kang Mi ri, who has never missed the first prize in all his school days, joined Hansung Group, a prominent chaebol after graduating from college. A person who broke through the glass ceiling to the position of director of marketing strategy department. In the stills, she is in the company lobby, with a such a cool poker face who is different from the charm she is showing in her mother`s presence. In her appearance captured in the lobby of the company, her aura, which can not be seen alone, is breathtaking. However, such a cool poker face is disarmed in front of her mother, Park Seon-ja (Kim Hae-sook), and her unhappy love affair is expected to attract unexpected charm. "My daughter, the most beautiful girl in the world,"`s Kim So-yeon, an actor who has a lot of laughter and care about the staff, said that she is fully immersed in the drama character 'Kangmyeri', and it seems that the concentration and charisma are really great. " No stills today... I was hoping to have more pictures. Maybe Monday. Korean women face the greatest pressure in Korea to leave their jobs and take care of their children once they have a family. When I think about Min Sun, she has to be a superwoman to manage to keep her work and take care of her family. Without the help of her husband in sharing responsibilities in houseworks, Mi sun`s day to day life will be very hard. I am watching tvN drama Romance is a Bonus Book and I cried watching the heroine struggle to find a proper job acording to her experience and education. She left her suscesful job to raise her daughter and after the divorce she had a hard time finding a job. Mi Ri joined Hansung group after graduating from one of the top universities. She is now a manager and I am sure she is working hard in the competitive environment and hoping maybe to get a promotion too. Being in such position, she works many hours a day and it is not hard to imagine why she did not start a family until now or that she has dificulties to mentain a romantic relationship. I don`t want to see women being forced to leave their job to have a child/ to take care of their family or to see a person becoming an workaholic, to spend way too long hours in the office. Just seeing the first stills of Mi sun and Mi Ri, and I become a little sad. I want them to be happy. I wish for them to find an work-life balance in their life, to be loved and to see them smiling. The next serial: Who is the principal lead? The title is "My Prettiest Daughter in the World", in which elderly lady Park Sun-Ja raised her three daughters, Mi-Sun, Mi-Ri & Mi-Hye. The title presumes that the principal lead is daughter Kang Mi-Ri. However, this is a week-end drama. The principal lead often turns out to be an elder. This switch usually becomes evident from the middle to the end. Thus, it would not be surprising if the principal lead turns out to be elder Sun-Ja, rather than young Mi-Ri. If so, the production team may need to be straightforward and revise the title into "My Best Mom in the World". Then, in Asianwiki synopsis, the image of Kim Hae-Sook, who plays Park Sun-Ja, may need to be prominent, instead of missing. Thus, viewers may know whether the serial is more focused on family relations or on romance, as different viewers may have different expectations, before they invest their time. Actor Hong Jonghyun turns into a passionate new employee. KBS2 In the new weekend drama 'My Beautiful Daughter in the World', Hong Jonghyun will show off his energy by acting as Han Tae Joo who has joined the big corporation. He has accumulated a lot of experience, including part-time jobs and internships, and he has a unique force. In particular, Han Tae-woo has become a member of the Marketing Strategy Team and has formed a team with manager Kang Mi-Ri (Kim So-yeon). First.... Welcome to this thread! I don`t think they have to change the title. Maybe it would have been better a shorter one. My Prettiest Daughter in the World is what a proud mother will say about her daughter/ daughters. About the leads... it is clear from the first script reading pictures and from the synopsis that the protagonists are Sun Ja and her three daughters. I did not watch many family dramas (I watched compleatly just one but I have read about some of them) but I have experience watching kdramas and I already knew what to expect from a drama just reading the synopsis. In this drama we`ll watch different stories. All three daughters will have their own story arc and Sun Ja as well. The mother will be the bond between these stories, her role is very important in this drama. Sun ja`s younger brother (the uncle of the girls) will be a mediator between them (mother and daughters). I don`t think it will be different from the majority of family dramas. The three sisters will have their own story arc but I do believe that Mi Ri (Kim So yeon) and Tae Joo (Hong Jung Hyun) will have a little more screen time but not too much. About Asianwiki page... they did not update at all for a long time. I think they will make changes when there is an official page at KBS. The English title is... Mother of Mine at Asianwiki. Our wish became true. According to the production crew, Cho Young-hun will appear in the healing family drama 'My Beautiful Daughter in the World', which will be broadcast following 'One Only Only', in March . In the drama, Han Tae-ju (Hong Jong Hyun) comes in as a new employee of Marketing Strategy Department . Kang Mye Ri (Kim So Yeon) is the head of the departement and Tae Ju learns work under 'Park Dae-ri (Cho Young-hoon)'. Park Dae-ri is a person who has a reputation in the company as a 'mood maker' with a lot of honesty and respect even though it is a little bit dull. He will mediate or encourage conflict between 'Alpha Girl' Mi Ri (Kim So-yeon) and 'Perfect Nam' Han Tae-joo. Jo Young-hoon, who made his debut with the music video of "I Love You" in 2007, is actively performing in various drama and theater stages such as MBC drama 'Beautiful You' , `Man Who Dies to Live`, or JTBC drama `Mirror of the Witch`. An anouncer posted a picture on his way of work. It seams that he will make a cameo in ep 2. Ki Tae-young shows the essence of 'perfect driven man'. Actor Ki Tae-young has been transformed into Kim Woo-jin and attracts attention, as he foresaw the story of a family who will warm the hearts of viewers this spring. 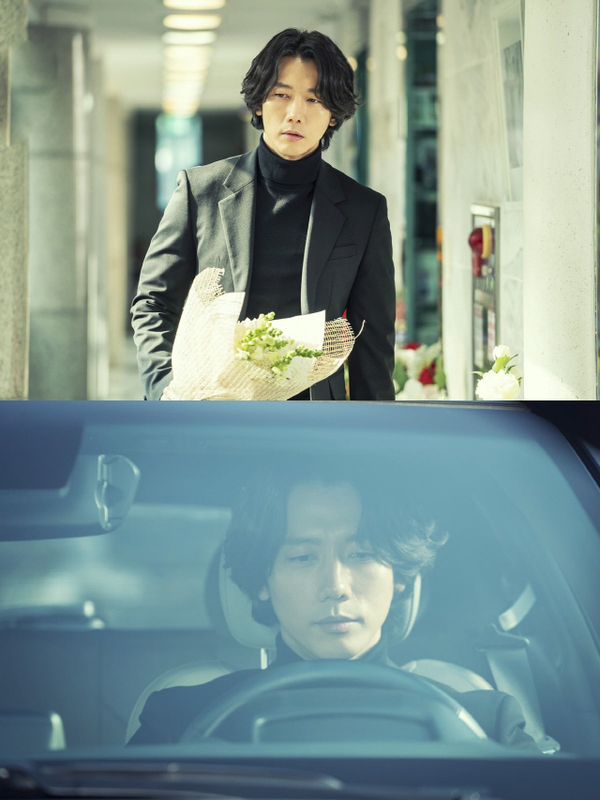 In the stills, he holds a bouquet of bright flowers, but his eyes are empty and he is sitting alone in his car. "I am shooting not only me but also the staff happily. Kim Jong-kwon seems to bring a good atmosphere because he makes everyone comfortable. I think the role of the chief is also important, "he said with a pleasant impression. "Kim Woo-jin is a friend who has both the ability and the ability to succeed in business. However, it is the character with the nostalgia, the love and the solitude in the father together. I want to express the loneliness in the form of Ki Tae Young. I hope that you will look at my new look with a loving gaze in the future, "he said. We found more information about his character. He will be involved in the story of Kang Mi Hye, the youngest daughter of Sun Ja, the one who is a writer. So, my initial thought was right. It makes sense because their profession will bring them together. I am glad that there is not love triangle in this drama. This way, everyone will have a happy ending.